Our NYAA Journey: Camp 1 2/4/11-3/4/11. our camp 1 was held over the weekend, for 2 days, 1 night. we met up at 8.30am to take a ferry to Pulau Ubin. 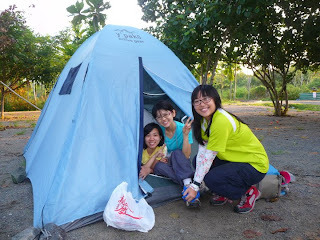 the first thing we did upon reaching the island was to walk to the campsite and pitch our tents. for most of us, being city folks, it was the first time pitching a tent. the YFFs showed us how to properly set up a 6-men tent with just 4 people, then we all tried our hand at setting up our own. after everyone set up their sleeping quarters, we prepared for lunch. lunch was beehoon with black fungus, mushrooms, fishcakes, cooked with our indian pots. dessert was beancurd skin with barley. after lunch, we split into our individual teams for activities. the YFFs put up a skit for us, about a kampong murder. in our teams, we're supposed to find clues at each station to solve the murder. at each station, we had to complete a different task. eg. at 'Elvis', we had to pitch a steady basha within 15mins. at 'Ah Leow', we had to transport him from one place to another. at 'Or Gow', we learnt how to make a fire from materials we could find. after dinner, we had a tiny campfire, where the Entertainment team put together about an hour of team bonding. we ended the first day at around 9pm for everyone to wash up, clean up, and get enough rest for the next day. at 7am, we were all awake, and by 8.30am, everyone had washed up, packed up, had breakfast, and broken tent already. at 9am, we set off for our topography exercise, where we followed a map using a compass, to 3 checkpoints around the island. at each checkpoint, we were given another task. eg. checkpoint 2 was at the base of a hill overlooking a quarry and river. we were split into pairs, and each pair was given a place to find, by a compass, given bearing, and distance, and a clue. the view from the top of the hill was beautiful. we ended our topo exercise at 12.30pm, and returned to singapore's main island at 1pm. at 2+pm, we reached back at ToaPayoh Central CC, and did our campwash. we ended everything, including debrief at 5.30pm. our debrief was really detailed, and gave us a clear insight of how camping in an unfamiliar place would be like. for our camp 2, we would be going to malaysia, to a mountain without any water source, or such luxuries like a toilet, etc.